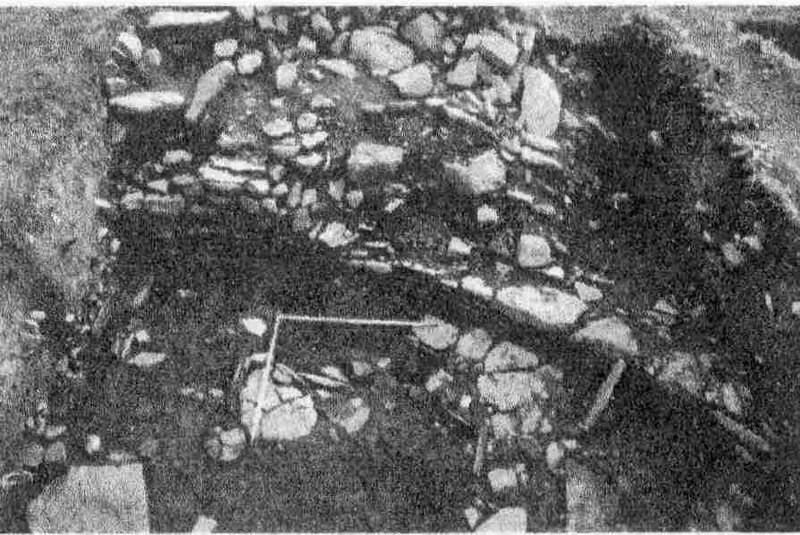 During the summer of 2001, small-scale excavations were conducted at the settlement mound of Everley, Freswick, Caithness (ND3699 6828) (Figure 1). The site is located in pasture approximately 50m east off the main A99 and measures up to 120m east-west and 50m north to south, rising c.2.5m above the modern land surface. Earthworks are visible on the eastern side. These excavations form part of a wider analysis of the Iron Age settlements excavated by Sir Francis Tress Barry between 1890 and 1904; 9 of which were published by Anderson in 1901 (see Heald and Jackson, forthcoming, or www.arcl.ed.ac.uk/arch/caithness/ for full project design). Barry excavated at Everley in 1897, however, apart from a short reference by Anderson (1901) little is known about his excavations; the site was never planned and only a few photographs survive. From these it appears that Barry’s primary concern was with the interior of a roundhouse, possibly a broch, but this is not certain. Location of Barry's roundhouse excavations on Sinclair’s Bay and Freswick Bay, including Everley. Although external structures were mentioned, surviving photographs and records suggest that Barry did not investigate them. However, he did retain a small collection of artefacts including bone and stone objects (querns, hammerstones, a steatite cup and sandstone lamps) that are paralleled on other Iron Age Scottish sites. Pottery also survives from Barry’s excavations, including fragments of Roman decorated Samian ware that - together with a fragment of hollow rim amber glass vessels provide evidence of Roman material reaching the area during the 1st and 2nd centuries AD (Robertson 1970, 208). Two copper alloy mounts were also recovered that probably served as horse decorations indicative of prestige in the Iron Age (F. Hunter pers. comm.). Reference to the discovery of a Viking comb at the site indicates later activity (Batey 1987b, 29). The primary objectives for the first season were to characterise aspects of the structures and deposits, to evaluate the extent of Barry’s investigations and ascertain a better understanding of his excavation techniques and retrieval strategies and to assess whether undisturbed levels still existed. Nine trenches were excavated (figure 2). Plan of site showing the location of excavation trenches. 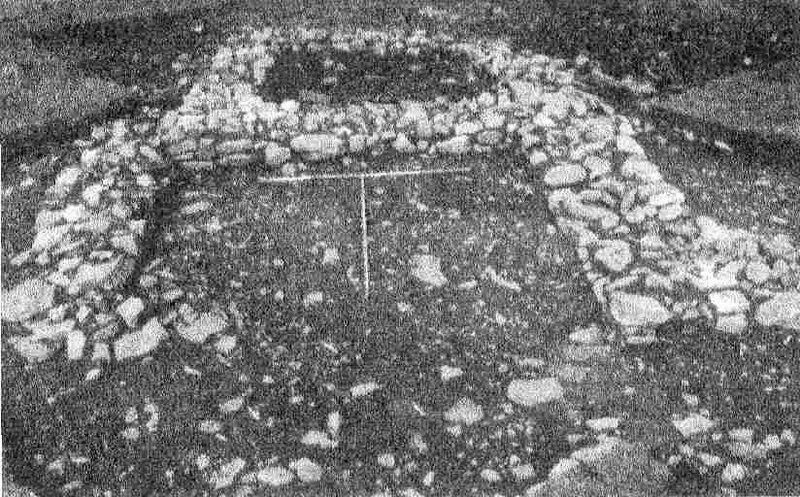 A few surviving photographs suggest that Barry excavated some form of roundhouse, probably a broch (Anderson 1901). However, no site plan was drawn and few architectural details were recorded. Furthermore, as is common on other Iron Age sites, it was likely that Barry would have encountered later reoccupation of the structure, however no record survives. The roundhouse was studied in three areas (Trenches A, F and G). Trench A (and its extension) investigated the eastern part of the roundhouse wall, Trench F investigated the western section of the roundhouse wall and possible entrance and Trench G investigated the interior. Trench G, measuring 4m x 5m, exposed approximately a sixth of the probable area of the roundhouse interior. Upon removal of topsoil, an area of rubble and clayey soil was uncovered that produced modern finds including fertilizer sacks, barbed wire, glass, plastic, bailing twine, wood and iron. Below this modern fill were another two which produced similar finds. The total depth of modern deposits was over 1.5m in places indicating the site had been used as a convenient dump for many decades. These deposits overlay a distinctive turf line that had formed after Barry had left. Under this, the roundhouse wall and a trampled surface were identified. The latter contained numerous 19th-century and Iron Age objects. In situ stone features and a hearth were also identified and it is clear that these deposits represented an interface between untouched Iron Age deposits and the late 19th-century archaeological activity associated with Barry. The quantity of Iron Age material remaining indicates that Barry was little concerned with the retrieval of more ‘mundane’ finds, such as native pottery and stone tools and explains why such artefacts are poorly represented in the National Museums of Scotland’s collections. Finds suggest that the roundhouse floor level at which Barry stopped dates to the first few centuries AD. Further excavation revealed the existence of in situ archaeology. Another hearth was found, with in situ whale vertebrae at its northern and southern extents. Associated with this were a series of layers representing trampled occupation surfaces and dumps. Iron Age pottery and stone objects were recovered, as well as a copper alloy ring. Upstanding stone settings were also identified including a vertical slab setting that abutted the roundhouse wall and defined the eastern edge of a hearth. Beneath these layers was a feature that at first looked like a stone filled pit abutting the roundhouse wall. However, although this feature was not excavated fully, initial investigation suggests that it may be a collapsed corbelled feature and further demonstrates the existence of complex in situ archaeology in the roundhouse (Plate 1). Trenches A and F were sited to uncover parts of the roundhouse wall and - it was hoped - indicate the location of the roundhouse entrance. Trench A measured 6m x 3m. Originally, it was assumed that a depression running east-west across the area was caused by cattle trampling across the roundhouse wall. However, further excavation revealed that this, though accentuated by cattle trampling, was the remains of Barry’s wall chasing trench, its shape mirroring the curvature of the wall (Plate 2). The fill of this cut yielded numerous 19th and 20th century finds. Excavation exposed the three courses of external wall discussed by Barry (Anderson 1901, 143). Anderson and Barry believed that these represented the surviving height of the structure. However, further investigation revealed this was not the case, as the height of the mound and the depth reached in the interior indicate that more remains to be exposed. A substantial rubble deposit sat on top of the roundhouse wall that yielded a considerable quantity of pottery. The assemblage included diagnostic pieces such as grass-tempered pottery, handles, finger-impressed rims, beaded rims and everted rims and preliminary investigation suggests this material ranges from the Iron Age to the Medieval periods. Trench F, 3m x 6m, was opened in an attempt to characterise the roundhouse wall and to locate the entrance; two surviving photographs suggest that this was placed on the south-western side of the roundhouse. However, over a metre of modern deposits had formed since Barry, including 20th-century glass, china, barbed wire and corroded iron tools. Below these modern deposits another fill was identified that may have been deposited very shortly after Barry ceased his excavations. This context produced the greatest number of finds, the majority of which were post-medieval china, glass, bone, slag and stone. A single undiagnostic Iron Age sherd and a retouched red flint flake were also found. As was the case in Trench A, a rubble layer was identified above the roundhouse wall. This context yielded prehistoric pottery (including diagnostic rim and base sherds), worked stone artefacts and quartz fragments. Removal of these deposits revealed that the section of the roundhouse wall had been heavily robbed to a significantly lower height than that surviving in Trench A. In the northern area of the trench two courses of large angular slabs were identified lying parallel to each other. Facing these, and lying at right angles to them, was a large upright slab that constitutes the probable remains of a door jamb. North east of this was the remains of a pivot stone. Although heavily robbed, these features point to the presence of the roundhouse entrance; this remains to be clarified by future excavation. Survey indicated that a large ditch encircled at least part of the mound. Comparable sites in Orkney and Caithness have similar features around Iron Age Atlantic roundhouses and settlements (Hedges 1987; Ballin Smith 1994; Swanson 1988). In an attempt to characterise the ditch a 12 x 1.5m slot trench (trench H) was opened on the eastern side of the mound where the feature was clearly visible. This trench ran east-west from the outer edge of the potential ditch towards the mound. Like many other parts of the site the ditch had been systematically infilled for decades, which explains the difficulty in tracing it on the northern, southern and western sides. Regrettably, time did not allow the complete excavation of the ditch, but modern deposits were traced to a depth of 1.5m. A steeply sloping eastern edge was identified that continued to a depth of 1.5m without any sign of bottoming out (plate 3). The western edge of the ditch was not identified, suggesting that it is beyond the extent of the slot trench. Although disappointing in finds, the limited excavation demonstrated that a considerable ditch existed and that the lower deposits may be waterlogged. Thus, should Iron Age levels survive, preservation may be good. The excavation of the external settlement at Everley was conducted to characterise those elements immediately below the modern surface to evaluate the site’s potential and to guide future exploration. Five trenches were opened; two of which (Trenches B and C) were initially opened with the intention of locating the roundhouse which was first thought to be more centrally situated at the top of the mound. Trench B measured 3m x 6.5m and was oriented west-south-west to east-north-east. Removal of turf and topsoil revealed a mixed layer of soil and rubble together with a wall running diagonally west-north-west to east-south-east. A second possible wall ran at right angles off the west face of the first. This wall was ephemeral and it is difficult to be certain that it was convincing structural feature. A patchy surface of earth and rough cobbling was associated with a small hearth set centrally against the west face of the main wall. Sherds of hand-made plain pottery were recovered from this structure, including beaded and everted rims. Excavation on the eastern side revealed that the wall sat upon an earlier alignment of large stones and a pavement of large slabs. This feature truncated to the east by a modern cut filled with rubble. 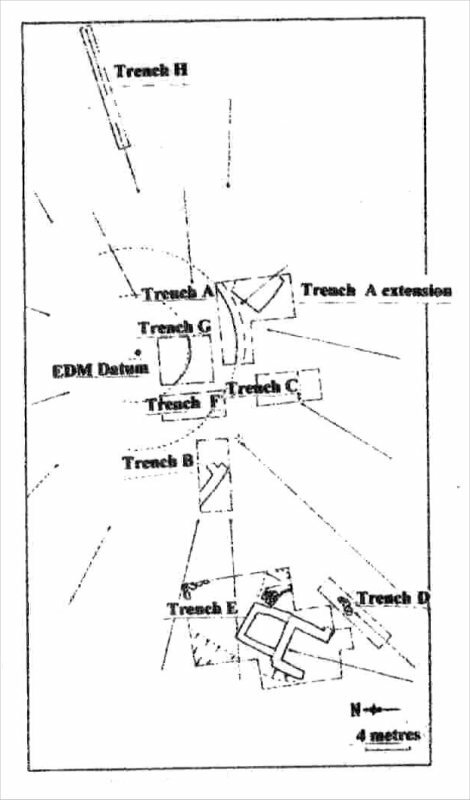 The cut’s alignment with the probable entranceway found in Trench F suggests it represents one of Barry’s trenches. The pavement and heavy stones might well represent the remnants of a route to the roundhouse. Trench C, 3.5m x 6m, was initially believed to overlie the possible roundhouse. Removal of the turf and topsoil revealed a mass of compact clay over the majority of the trench which represents modern dumping. To the south stone rubble was uncovered beneath which was a portion of wall, a blocked entrance and associated paving with an in situ pivot stone. This structure was clearly not part of the roundhouse and must represent some form of external structure. Further characterization must await next year’s work. A Late Norse / Early Medieval building? Trench A was extended to reveal a rectilinear structure on the south side of the trench outside the roundhouse wall. This structure probably originally abutted the roundhouse, however Barry had removed all evidence of this during his chasing of the roundhouse wall. The topsoil and the context immediately below produced fragments of pottery including grass-tempered pottery and a sherd of wheel-turned pottery. Among the grass-tempered pieces was a handle, similar to examples of Late Norse/Medieval date found at Freswick and Robertshaven. Other finds included a lead spindle whorl, similar to others found on late Norse/early Medieval sites, such as Freswick, a smithing bottom and a stone spindle whorl. Beneath the rubble fill a peat-ash and earth floor was exposed, with distinctive areas of peat-ash burning. A Post-Medieval building and ‘yard’? Situated on the western slope of the mound, Trench E, 15m x 12m, was designed to characterise and determine the extent of any surviving external settlement in this area. Excavation was conducted initially on a small scale, with subsequent extensions to elucidate the nature of the structures revealed. The excavations uncovered substantial structural remains, with associated in situ deposits. Directly beneath the topsoil, a layer of angular rubble was exposed with wall faces poking through. Removal of this tumble and dumping, most of which filled the underlying structure, revealed a two-roomed rectilinear structure 9m long by a maximum 5.5m wide with walls surviving to a maximum height of 40cm (1-3 courses surviving) (Plate 3). Two phases of building were evident, with the walls of the northern room abutting the southern. The latter’s floor consisted of closely packed cobbles within a reddish brown silty matrix with peat ash dumps in the corners of the room. Aside from these peat ash deposits, the floor was extremely sterile with no finds except some broken animal teeth. The floor of the northern room was markedly different, consisting of a dark clayey trampled surface that contained a high concentration of charcoal, burnt bone inclusions and peat ash flecks, as well as potsherds and lead wire. A hearth set in a crude arrangement of stones was located 40cm from the centre of the north gable. Initially, this structure was interpreted as being of Late Norse date because of its formal similarities with Late Norse buildings recovered at nearby Freswick (Curle 1939; Batey 1987b). A piece of grass tempered pottery may support this idea. An alternative interpretation, however, is that the structure is of post-Medieval date. One of its intriguing features was the absence of a southern gable wall that was initially thought to have been robbed. However, the western and eastern walls finished at the same point and were too neatly faced to suggest robbing. Flat slabs projecting into the floor from the walls suggest a cruck frame construction, used in structures of this period and others. Explanation for the absence of a gable wall may lie in the purpose to which this room was put. Ethnological records reveal the common practice of wintering livestock by placing them into a structure and then walling them up with a temporary wall of alternate courses of stone and turf. With the return of warm weather, the wall would be removed to release the livestock and facilitate mucking out. It was common for the floor of the byre to slope away towards the temporary gable so that the liquid effluent flowed away from the dwelling room. On abandonment such a structure would be left open ended and it is probable that the roof would have been removed (or salvaged), leaving the cobbled floor open to the elements. Associated with this structure was an area of densely packed cobbling. Set within this cobbled surface was an oval feature of larger stones that may represent the base of a small corn-drying stack. In the northeastern corner of the trench a number of stone slabs were located forming a feature of unknown function. At the northwest corner of the main structure a heap of peat ash overlay the cobble layer, indicating repeated dumping of ash outside the structure during its lifetime. A total of 555 small finds and over 1100 pottery sherds were recovered during the 2001 season. Although much post-excavation work is needed before wider discussion can take place a few salient points can be made. The stone assemblage includes many objects common on Iron Age sites (e.g. hammerstones, polishers, pivot stones and querns). The few fragments of steatite are of note, indicating the import of material from out side Caithness. Few bone objects were recovered, although their recovery suggests that we can expect this material to be preserved in lower levels. One of the major outcomes of this year’s excavations was the recovery of significant quantity of pottery that included a variety of diagnostic forms and fabrics such as everted rims, beaded rims, finger-impressed rims, grass-tempered pottery and handles. Initial analysis indicates that the pottery covers a wide time period from the Iron Age to the post-Medieval period (MacSween per.comm.). This is important, as our understanding of Caithness pottery sequences from circa 200BC through to AD1500 is poor. Interpretations at this stage are necessarily tentative and incomplete. Little post-excavation analysis and no programme of radiocarbon dating has yet been undertaken. Nevertheless, the first season of excavation has proved remarkably fruitful. Attempts to characterise the site were partly met with the exposure of a section of the roundhouse wall, part of the interior (including internal furnishings and hearths) and later external settlement including possible Late Norse (Medieval) and post-Medieval structures. The excavations also improved our understandings of Barry’s excavation methodologies and the collection strategies he employed. The discovery and re-opening of Barry’s trenches allowed us to retrace his excavation and supported observations made during re-survey of a number of Barry’s other sites. Clearly, Barry did not backfill his excavation of the Everley roundhouse interior but left it open as elsewhere; in the process he left upstanding interior features and hearths perhaps out of a conscious desire to leave a visible record of his work. Furthermore, the recovery of numerous Iron Age sherds and stone artefacts from Barry’s ‘abandonment level’ suggests that he favoured the more exotic or highly finished items and ignored the more prosaic and/or ubiquitous elements of native material culture. This is eloquently demonstrated by the reuse of querns in his commemorative monuments (e.g. at nearby Nybster). While these discoveries inform the antiquarian study of Tress Barry the excavations have wider significance. It is clear that Barry did not excavate all of the mound: he stopped at an arbitrary floor level in the roundhouse interior and left much of the exterior untouched. These remaining in situ deposits provide an invaluable opportunity to gain new insights into the character of the Iron Age and Norse periods. Future excavations will be directed to the examination. Only then can we begin to understand better the undoubtedly complex site that Barry explored and continue to reconstruct the wider social setting of Everley. Excavations were funded by the National Museums of Scotland, Edinburgh University and the Russell Trust to whom grateful thanks are due. Particular thanks to Dr David Clarke, Fraser Hunter, Dr Simon Gilmour and Professor Dennis Harding for encouragement and discussion. Thanks to Ann MacSween for initial discussion of the pottery from the site. We are indebted to the landowner, Mr Ian Angus, for permission to excavate on his land and to the invaluable support and kindness of Alex and Linda Norburn for tolerating us during excavating and living at Everley. We are grateful to all the locals of Caithness who demonstrated great enthusiasm and kindness, particularly to Paul Humphreys, Jack Dunnett, Nan & George Bethune, and Meg Sinclair. Thanks to the hard-working and enthusiastic excavation team who made the whole exercise a successful and pleasant one: Iain Cameron, Alisdair Curtis, Grant Lock, Leonard McKinney, Dawn McLaren, Jennie Marshall, Steven Orr, Camilla Priede, Gillian Turnbull and Lee-Anne Whitelaw. Figure 2 is modified from Paul Humphrey’s original plane table survey. Anderson, J 1901 ‘Notice of nine brochs along the Caithness coast from Keiss Bay to Skirza Head, excavated by Sir Francis Tress Barry, Bart, MP, of Keiss Castle, Caithness’, Proc Soc Antiq Scot, 35 (1900-1), 112-48. Ballin Smith, B 1994 Howe: Four Millennia of Orkney Prehistory. Edinburgh (=Soc Antiq Scot Monogr Ser, 9). Batey, C 1987 Freswick Links, Caithness. A re-appraisal of the Late Norse site in its context. Oxford (=Brit Archaeol Rep Brit Ser, 179, 2 vols). Curle, J 1939 ‘A Viking Settlement at Freswick, Caithness. Report on the excavations carried out in 1937 and 1938’, Proc Soc Antiq Scot, 73 (1938-9), 71-110. Heald, A & Jackson, A forthcoming ‘Towards a New Understanding of Iron Age Caithness’, Proc Soc Antiq Scot, (2001), 131. Hedges, J W 1987 Bu, Gurness and the Brochs of Orkney Vol 1-3. Oxford (=Brit Archaeol Rep Brit Ser, 163-5). 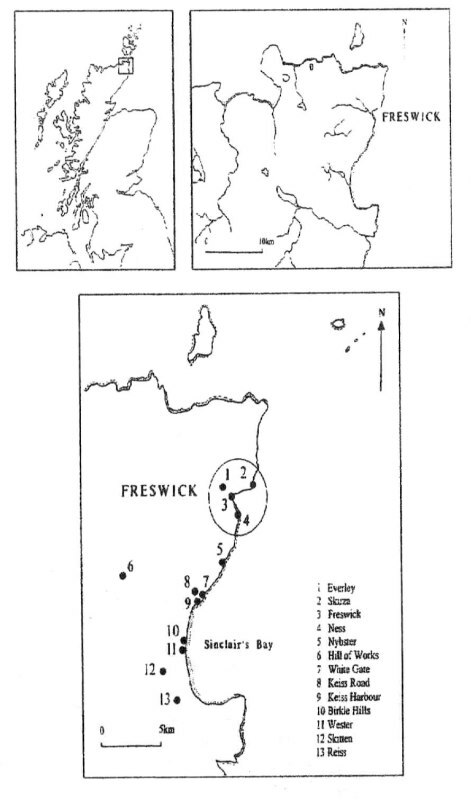 Robertson, A S 1970 ‘Roman finds from non-Roman sites in Scotland’, Britannia, 1 (1970), 198-226. Swanson, C 1988 A Contribution to a new understanding of Brochs, unpub PhD thesis, Univ Edinburgh.